Polaris Outlaw 50 Youth ATV - Best Choice for a Youth Four Wheeler? When it comes to youth ATVs - is the Polaris Outlaw 50 the best choice? We won't try to decide for you, but we will do the hard research to dig up the facts so you can make an informed decision. We try to sift through all the hype to filter out those nuggets of truth that really tell you what a machine is all about. And help you decide if it's the right one for you. They all have strengths and weaknesses - so it just comes down to what is the most important for you. So here we go! 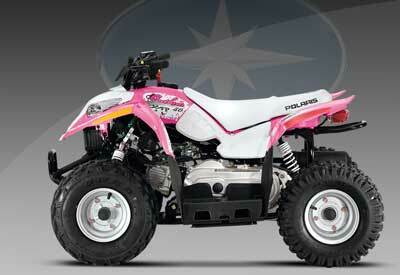 First off, the manufacturer is not really Polaris, it's a Taiwan company that builds the youth ATVs for Polaris. Not that there's anything wrong with that - just thought you should know. Since the Polaris Outlaw 50 will probably be a little tyke's first ATV - things are kept pretty simple. Polaris seems to be trying to walk a fine line between offering a value priced Youth ATV but with the backing of a major factory and it's dealer network. Considering the little Outlaw is built to Polaris specs - the quality looks about right for the price. Better than the Chinese ATVs being sold in flea markets or strip centers. You pay more - but you'll have a dealer you can rely on for parts and service. Adjustable foot board height - for a better fit as the kid grows. Most owners felt like the Outlaw 50 was a good value. It's stylish looks and tough build quality were mentioned most often. The ability to restrict the top speed and the safety tether were also appreciated. At this level, performance didn't seem to be much of a priority so most folks thought it was good enough. Some spotty reliability issues - several of which seemed to be caused by poor dealer prep and/or assembly. Poor idling, lack of power, fouling spark plugs, battery straps left off, loose nuts and bolts, etc. These are all dealer prep issues. Just like a lot of buying decisions - it may depend on your confidence in your local dealer. I always recommend asking around about the dealer's reputation and even checking with the Better Business Bureau. If possible, make a few visits to see what kind of "vibe" you get. If something doesn't feel right - go to another dealer or consider a different brand with a better dealer. Our research didn't really reveal any glaring faults with the Polaris Outlaw 50. It did what was expected within reason and seems to be a good value for the asking price. It would sure make our short list for a beginners Youth ATV. When it comes to problems, it seems that some dealers may be their own worst enemies. I would be much more concerned about that, than any issues with the machine itself. Polaris Outlaw 90 - Is the Polaris Outlaw 90 the Best Youth Four Wheeler? Find Out in This Exclusive Report.